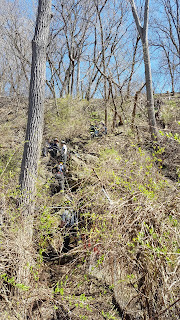 found a well-entrenched brush fire working its way down the steep embankment. Penfield and Brighton firefighters utilized a line from 376 with Class A foam plus hand tools to slow the progress of the fire while additional Brighton units established a water supply from Dale Rd. CSX employees were also on scene making sure it was safe for firefighters to operate in the area. CSX workers provided access for the hose line by digging underneath the tracks so trains could resume their travels at a reduced speed. Firefighters were on scene for an extended period of time extinguishing the fire. 1323 hrs. While 376 was operating at the brush fire along the railroad tracks another call was received, not far from that incident, for a person who had fallen and was trapped on a cliff behind the Paychex facility on Linden Rd. First arriving units found a female victim had fallen down the cliff after trying to retrieve her dog who had gotten away from her. A rescue truck from East Rochester was requested to the scene to assist. 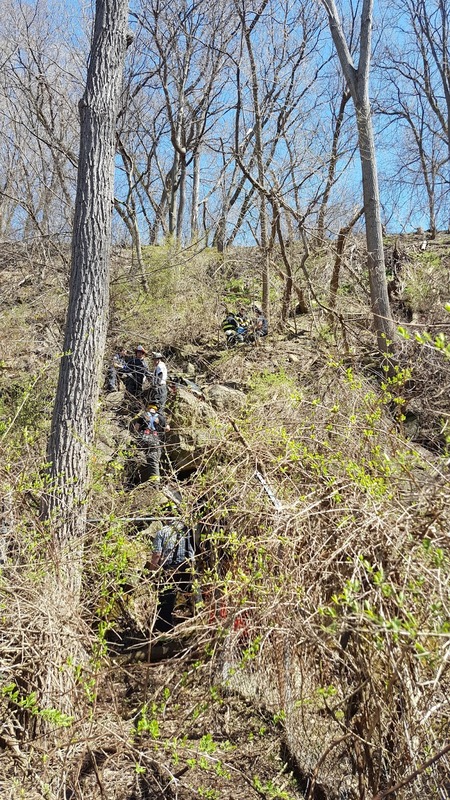 Firefighters from Penfield and East Rochester cut thru heavy brush, trees and fencing to gain access to the hill before deploying ropes and a stokes basket to safely extricate the victim. Patient care was provided by Penfield Ambulance. The victim's dog was located at the bottom of the hill and safely returned to its owner by MCSO.